An 8-sheet Otis lithograph for Houdini's "Buried Alive!" is among a collection of more that 1,200 vintage posters to be auctioned by Heritage on March 22 and 23 in Dallas. Some of the posters were recently discovered above a garage in Ohio (it's unclear if Buried Alive! was among these). The auction says the poster is in "jaw-dropping condition." Estimate is $14,000 - $28,000. However, the Handcuff King might find himself bested by the King of Vampires and the King of the Jungle. A 7-foot tall Dracula poster is estimate at $40,000, as is a 7-foot wide French King Kong poster. "This auction has mystery, intrigue, and hidden treasure — and we're not talking about the movies!" said Grey Smith, Director of Movie Posters at Heritage. "Many of the posters offered are appearing at auction for the first time and some were just recently discovered in an attic above a garage in Ohio." "Buried Alive!" advertises Houdini's stage-bound Buried Alive escape, which he appears to have performed only a few times before his death in 1926. 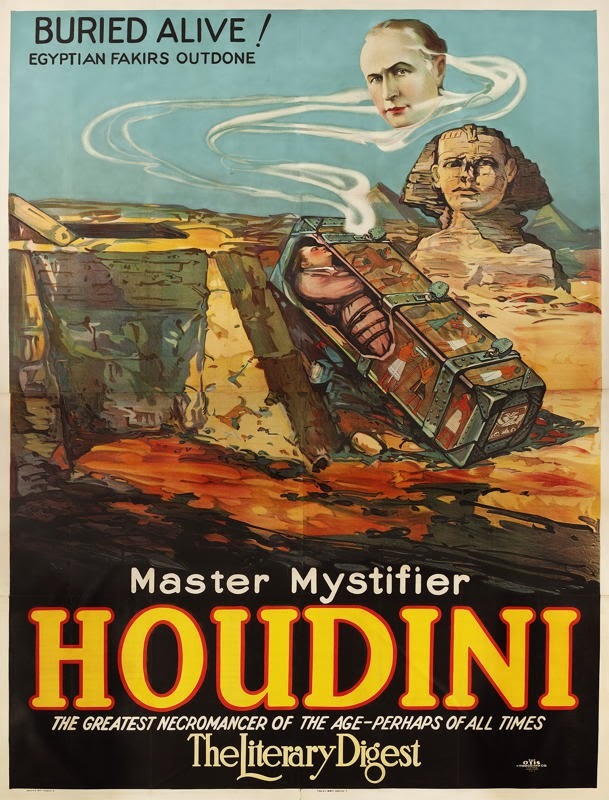 The box Houdini used in this effect was used to ship his body from Detroit back to New York. You can get more information on the auction at Heritage Auction House. Buried Alive! is Lot 83229. UPDATE: Looks like this sold for $8,365.00. Cool, great Kong poster in there as well.